Dinner will be served. To help our sponsor prepare, please RSVP to holly@ssi-physicaltherapy.com or Trudy_messer@bshsi.org by Friday, Sept. 5 at 5 p.m. The APTA Learning Center now offers "Navigating the Regulatory Environment: Ensuring Compliance While Promoting Professional Integrity" free to all members and non-members. The 2-part course includes an audio roundtable, with experienced and knowledgeable presenters reviewing topics such as laws and regulations related to health care fraud and abuse, along with interactive case vignettes drawn from real-world situations to illustrate types of Medicare fraud or abuse involving physical therapy services. For access and to register, visit this Learning Center page. If you or someone you know is a clinical instructor or health care provider who works primarily in a clinical setting, please consider enrolling in APTA's Credentialed Clinical Instructor Program (CCIP). Participants explore various aspects of the clinical learning environment and learn skills and techniques needed to provide students with a structured and effective learning environment. 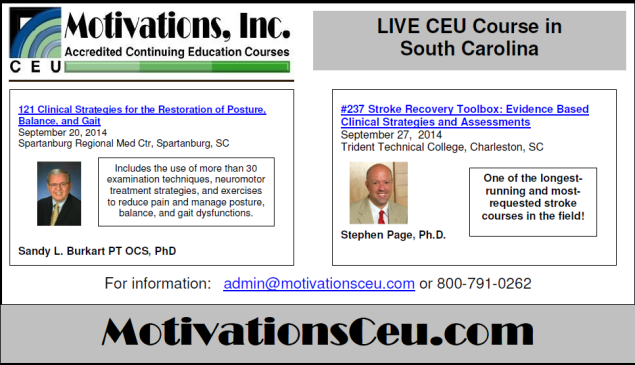 Successful course completion results in the awarding of 1.5 CEUs and the Clinical Instructor credential. The 2014 CCIP course schedule is posted and several courses are being offered this fall. While we have been busy defending the PT practice, SCAPTA has also been actively working on co-pay legislation to begin to limit the amount of co-pays some of our patients have to pay each and every time they come they see a PT. This legislation can have a direct effect on not only the patients we serve, but all practice areas. We need funding to support legislative activities to protect our profession in South Carolina. Make a recurring gift of just $10 and make a difference. Researchers are tripping seniors on purpose, and it's not some kind of warped practical joke. The experiment is among techniques being studied to prevent falls, the leading cause of injury in older adults. Falls by the elderly cost $30 billion yearly to treat and can send them spiraling into poor health and disability. In an effort to ensure accurate information is included in their Open Payments database, CMS announced it has returned approximately one-third of records submitted to manufacturers and group purchasing organizations due to intermingled and erroneous data. After detecting such errors as incorrect payment records caused by a mix-up of national provider identifiers, CMS closed the reporting system. Are your practice's medical records vulnerable to theft? Health care utilization and cost data released in the name of "transparency" continue to make headlines, and physical therapists need to have a solid grasp of what's already out there — and what's to come — in order to help patients, clients and other stakeholders understand what all the information means in context. Physical therapy not only helps individuals recover from an injury or accident, it can help control the pain of many age-related problems, such as arthritis and fatigue. After a fall, many senior citizens require assistance with improving their balance, flexibility, strength and range of motion. The possibility of losing independence, pain in performing everyday tasks, and losing function of limbs and muscles are all motivators for consulting a physical therapist. By Charles Stuart Platkin: Recently, I was able to catch up with an expert in physical therapy and dance, Colorado-based Mieke Scripps. She studied dance and kinesiology at the University of Wisconsin while performing in the modern dance troop Li Chiao-Ping Dance. After her dance career, she received her doctorate in physical therapy from Northwestern University. Flexibility separates champions from good athletes. Releasing muscles in the proper way maximizes power, supercharges speed, and helps you perform jaw-dropping moves. Basic stretching can increase your flexibility, but it won't necessarily guarantee optimal results. Like the guy swinging off the pull-down bar without building his lats, many athletes stretch for years and get nearly nothing out of it. See what I did there? Oh, nevermind. Having been practicing in the field of sports injury rehabilitation for the last nine years, I've spoken to, assessed and treated hundreds of people for varying injuries and pain conditions. While it is a serious thing to be dealing with someone's health, I also think every job should have its lighter moments and sometimes we all need to have a little giggle. It's healthy!